Abu Dhabi Summer Season’s selection of superb performances, entertainment, activities, discounts and offers has something for all the family! Stay cool in Abu Dhabi this summer and take part in the celebrations across the emirate. In collaboration with the Department of Economic Development Abu Dhabi and 20 of the emirate’s shopping malls, ADSS offers mall discounts up to 80%, in addition to ‘Unbox the Amazing’ promotion that allows shoppers chance to win instant prizes with the purchase-on-purchase offer across 8 malls. Running from June 29 – September 1, ‘Unbox the Amazing’ features a raffle draw with a Nissan Patrol cars as prizes along with a variety of entertainment activities and performances! ADSS 2018 will include a unique shop & win two different promotions from June 29th – August 18th called “Unbox the Amazing” at 20 participating malls across the emirate as well as a chance to enter a car raffle for winning one of the 4 Nissan Patrol Cars by Al Masaood Automobiles. These malls include: Marina Mall, Khalidya Mall, Deerfields, Dalma Mall, Bawabat Al Sharq, Wahda Mall, Hili Mall, WTC Mall, Yas Mall, Al Raha Mall, City Mall, Al Ain Mall, Mushrif Mall, Mazyad Mall, Madinat Zayed, Bawadi Mall, Barari Mall, Ruwais Mall, Al Foah Mall, and Jimi Mall. 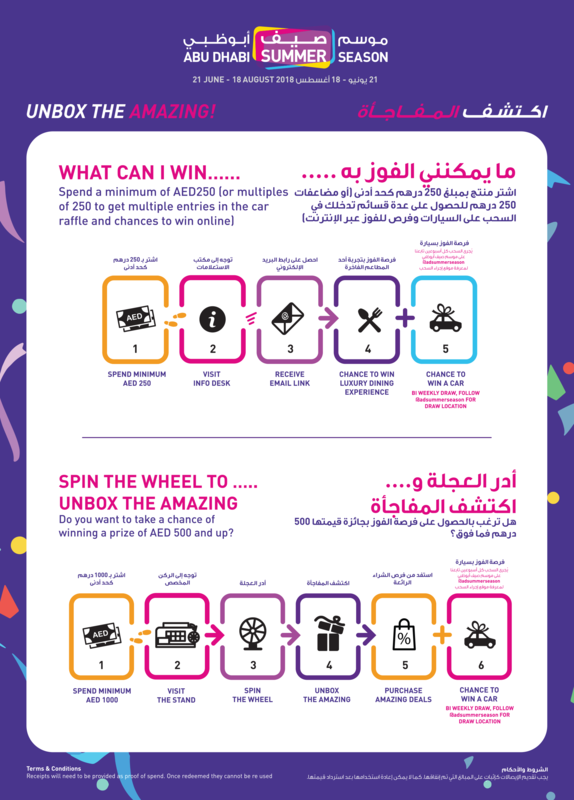 Created especially for ADSS 2018, DCT Abu Dhabi will also be bringing a fun ‘game’ experience every day to the 20 participating malls across the city where, for every 250 AED minimum spend, shoppers will get the chance to win instant prizes like luxury dining at high-end hotels’ restaurants, and enter a grand car raffle. Once 250AED is spent, the shoppers can validate their bill at the mall kiosk, at which point they will be given instructions on how to register digitally for a chance to win luxury dining vouchers at Abu Dhabi’s hotel restaurants. Once they have entered the online platform, they are then free to redeem their prize, or try again. Entries are only limited to the number of multiples of AED250 that the customer has spent at any of the participating mall outlets during ADSS, thus if they spend AED500 they get two entries, AED750 three entries, and so on – the more people spend, the more they get the opportunity for multiple trials for a chance to win the prizes. While learning how to enter at the mall information desk, all customers who spend multiples of AED250 will also be given coupons to enter the grand prize raffle draw to win a car! Also, shoppers who spend a minimum of 250AED can try their luck to win instant prizes through playing an in-mall game concept. This is to engage shoppers and encourage them to check-out this exciting retail promotion, and ultimately get the chance to win prizes! The ‘Unbox the Amazing’ purchase-on-purchase promotion will be held as part of a show and will have a variety of entertainment activations for shoppers at participating malls, along with musical and performing acts. A stage along with an host and a spin-the-wheel game will be on show and will travel to each of the 8 participating malls during weekends and allow winners the chance to ‘unbox the amazing’ via a wall of boxes when a minimum of 1,000AED is spent. Customer gets multiple chances if the purchase has been made in multiples of AED 1,000. For example, on spend of AED 2000, customer gets 2 chances to spin the wheel. Abu Dhabi Summer Season brings a sensational line-up of concerts, theatre shows and comedy with superb performances in Abu Dhabi city, Al Ain and Al Dhafra. Let us introduce you to our home - Abu Dhabi, from its ancient past to its modern wonders, through breathtaking natural environments and unforgettable experiences. Keep your boarding pass to get access to incredible discounts at some of the best restaurants, spas and attractions in Abu Dhabi. Simply present your boarding pass to receive your discounts. Copyright © 2018 Department of Culture And Tourism Abu Dhabi. All Rights Reserved.